Wet end components of Vanton CHEM-GARD® centrifugal pumps are injection molded of corrosion resistant polypropylene (PP), polyvinyl chloride (PVC), chlorinated polyvinyl chloride (CPVC), polyvinylidene fluoride (PVDF), ethylene chlorotrifluoroethylene (ECTFE) or other non-metallic materials that are 100% inert to the fluids being handled across the entire pH range. 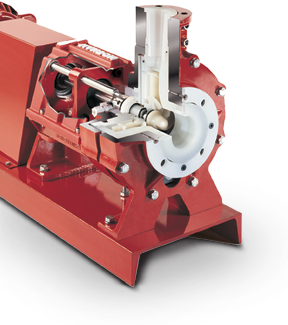 This eliminates the corrosion and failure associated with pumps constructed of stainless steel and other alloys, the wicking associated with fiberglass pump components and the delaminating inherent with plastic-lined metal pumps. Unlike metals (including stainless steel, Hastelloy® and other alloys) that have annual rates of corrosion, Vanton thermoplastics are inert, allowing ultrapure liquids to be transferred free of contamination. combination close-coupled/mag-drive, sealless, and motor designs with integral pump shafts.